It's amazing the things we can do with fabric. In this case, Erika created a beautiful sunrise by choosing the right color combinations. Her quilting adds the finishing touch. "Use your judgment when purchasing your fabric. Lay your fabrics out next to each other, and then decide whether the combination gives the “sunrise effect” you’re looking for. Don’t hesitate to substitute other colors or to mix fabric lines – this is your quilt, so select the shades you like! What if you don’t like solids? Feel free to substitute small or mono-colored prints that “read” solid. 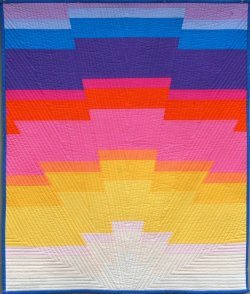 Avoid large prints, busy designs, and those with lots of colors – the extra lines and patterns will muddy the colors and you’ll lose the striking effect of the “fractured” sunrise."